The Crows Nest Observatory is a privately owned and operated astronomical facility. The observatory´s operation is focussed on research and informal education. The CNO´s name refers to its location on the South-Eastern slopes of the Crows Nest, a hill (385 m) in the North of Wellington, the capital of Aotearoa New Zealand. 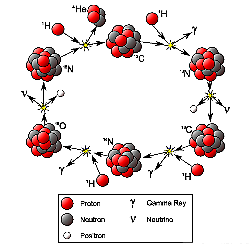 CNO is also the abbreviated name of a nuclear fusion process in the interior of stars, first proposed in 1938 by physicists Hans Bethe and Carl Friedrich von Weizsäcker. In German literature it is often referred to as the "Bethe-Weizsäcker Zyklus". This CNO-Cycle describes the generation of energy via a closed process chain involving the elements Carbon, Nitrogen and Oxygen (C, N and O). Another significance of the reference to CNO is the plan that the observatory be eventually powered solely by solar energy.